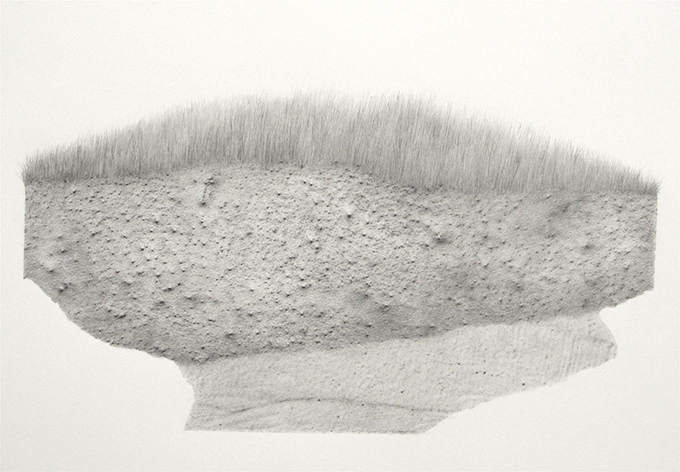 Ridge, 2014, Graphite frottage on paper, 26 x 29cm. 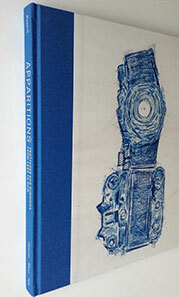 The drawings are a continuation of my interest in the relationship between the real and the artificial or invented. The idea of a model being a representation of something which either exists (an authentic representation of the real thing) or which is the 3D embodiment of an imagined object, is one which I find interesting in relation to the act of drawing and representation in two dimensions. For these three groups of drawings, the inspirational replicas or models were either resin casts of soil and glass boxed earth specimens (1:1 in scale), the mould- made model forms of vast mountain ranges or the scaled down wooden projections of the real or future world, found in architectural models. 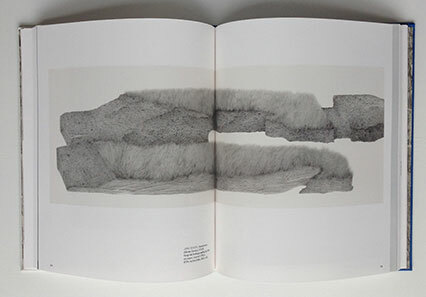 The drawings incorporate surface rubbings from the physical world and pure invention to make both a conceptual and visual play with the real and potential scale of the object depicted. 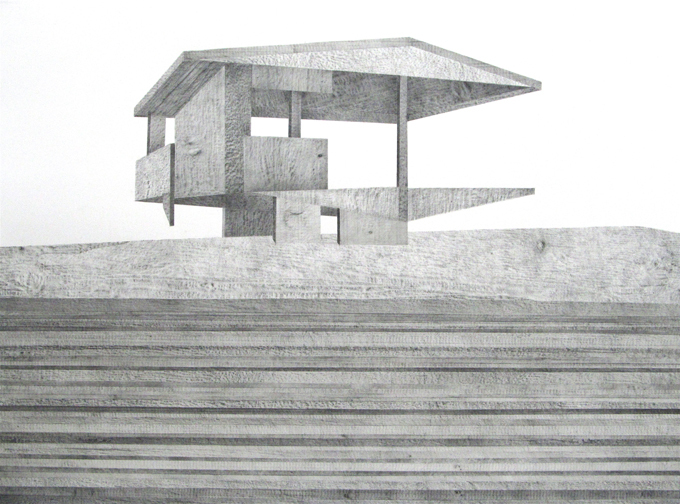 'Platform' 2012, Awarded Judges Special Commendation, Jerwood Drawing Prize 2012. 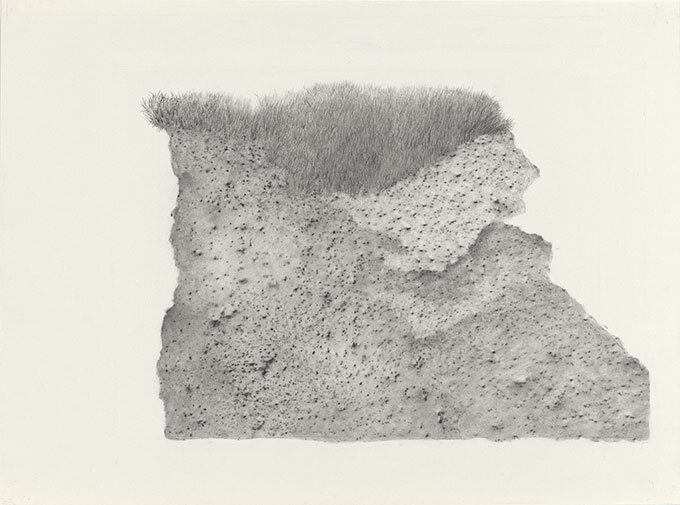 'Monument', 2011 (from Model Series) Graphite frottage on paper, 28x38cm Acquired by the Fitzwilliam Museum, Cambridge. Landscape, 2013 (from Model Series). 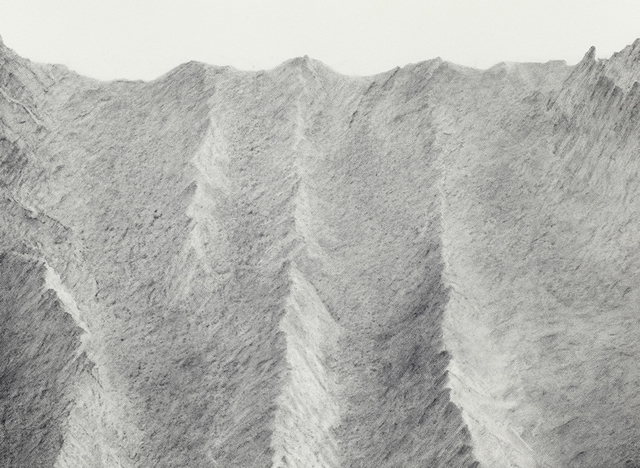 Graphite frottage and pencil on paper, 56 x 153cm.